It began in the airport. I found a quiet port to sit by in between flights, and pulled out my laptop from my backpack. My head was in a cloud of places. Questions of doubt and fear and worry — you could tell the lizard brain was in a furry. But upon seeing that alien cryptic for the first time, I could feel the rush of excitement spill over. It always begins with a leap of faith like that. I literally couldn’t have told you a single word. Between the scribbling down of some basic key phrases, I could feel in my gut the verge of something epic on the horizon. I was flying to Greece and attempting to learn fluent Greek in 3 months. Airports have always been an interesting point of intersection in the past. Everyone is in a constant state of movement. Crossroads for people arriving, coming, and going. In previous travel experiences, these have always been a interesting point of interactions, and this time proved to be no different. “τι κανετε,” I said with a wide grin smile. Staring back at me was a bright pair of olive green eyes behind a soft complexion. She was a Greek woman in her 30’s or so, and upon hearing she was Greek, I couldn’t resist practicing what little I had just wrote down. “τι κανεισ” is what you mean to say, you have to conjugate it depending on your subject.” She laughed, and then we dove through the rest of my scribbled notes of sayings and phrases. The first thing that caught my attention was her use of the word Bravo (μπρανο). It was such a cute way of congratulations. She would say it after everything I pronounced correctly. “Mπρανο” (written like mpravo). I had always associated bravo for more of an applause after an opera or some classical context. I couldn’t help but smile; its use here was charmingly seductive. Learning languages changes the way you perceive the world. It changes the way you think. The thoughts you are capable of having. How you preceive yourself and make sense of the world around you. Like a toddler, you’re launched into a new macrocosm and trying to absorb every little bit of information around you. I always feel my brain go into a hyper state of perception when in a new countries. Over the past couple years, I’ve taught myself Spanish, Portuguese, and Indonesian. My goal is to expand that lexicon to include Greek. My method is incredibly simply for doing this. There are only two steps! Every interaction — in public transit, at the restaurant, super market, coffee shop, park, night club, office — you name it — offers the opportunity to learn a new word. Just focus on absorbing one new word or expression at a time. I do this by isolating one words or phrase of something they said, and asking them to write it down. Sometimes on a receipt, sometimes in my phone, on a piece of paper — anything really. But just get it down, and ask for no more than 1-3 at a time. 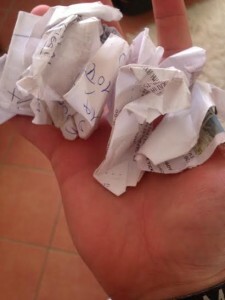 I was doing laundry the other day, and pulled out a fist full of scribbled notes with new words and expressions. Keep an on going updated list. This can be in a notebook or a pad on on your phone/computer. I prefer to do both. This part is about accumulating the sounds, expressions, and phrases you’ll need to express yourself. The next part is key for actually retaining the material. The biggest secret to learning new languages is this! Instead of trying to learn a new word by saying it in over and over again in your head, use mnemonics and context to embed words with unforgettable associations. You jam pack words with so much more information this way. It makes it 10x easier to pull a word to the tip of your tongue when in mid-conversation. Συνώμη – (sig no me). The word for excuse me. Kinda sounds like signal me, as in excuse me, I am trying to signal to pass by you. Can we take it a step further? It also kinda sounds like “cig” and “gnome.” So I imagine a little gnome on my shoulder smoking a cig in one hand, and in other hand a large turn signal that he flashes whenever I need to excuse myself. Sig no me. Δεν ξερω – (then exero). The word for I don’t know. The wise Greek philosopher Socrates taught that wisdom is the recognition of realizing you know nothing. I thought I knew a lot, but then I realized I knew zero. Then exero. It might sound a little goofy, but this method is incredible effective. 10x more so than trying to repeat a vocal pattern over and over and beat it into your brain by submission. Not only is it more effective for retention, but you get to experience another added benefit. This method forces you to make creative imagery and details around the words you use. You have to stitch together unrelated topics, often on the fly, and make new connections and associations. This is the very definition of what creativity is! In his book Moonwalking With Einstein, Joshua Foer talks about how he used this same method to become the U.S. Memory Champion in just 1 year. As a journalist, he had covered the previous years event, and then fascinated by the event decided to try and compete in next years competition. He used these exact same methods upon other memory techniques. Really, that’s it. Now at this point it’s just simple matter of exposure. Get yourself out there, and keep adding to your word/phrase bank. Write down the words and phrases you’re running into, and then use that memory method to absorb them. Don’t get frustrated if it takes some time or if it can be a little difficult to come up with word stories on the spot, its a creative muscle that gets worked better with time. Practice speaking out loud rather than just saying it in your head. Listen to the vocal vibrations and the muscles in the mouth being used. Locating where the sounds originate from goes a long way into pronouncing words like a native. One of my favorite things thus far with Greek is discovering the roots of some classic English words. Here are a few examples of some of my favorites.